Quinoa was lying in my pantry for a long time. So finally decided to give it a go. Just added the vegetables I like and followed my taste buds, the taste which I was craving for, out of Quinoa, and it was amazing. I did not thought Quinoa can be so tasty with the Indian spices. One can add any vegetables one likes. Wash the Quinoa thoroughly in water. 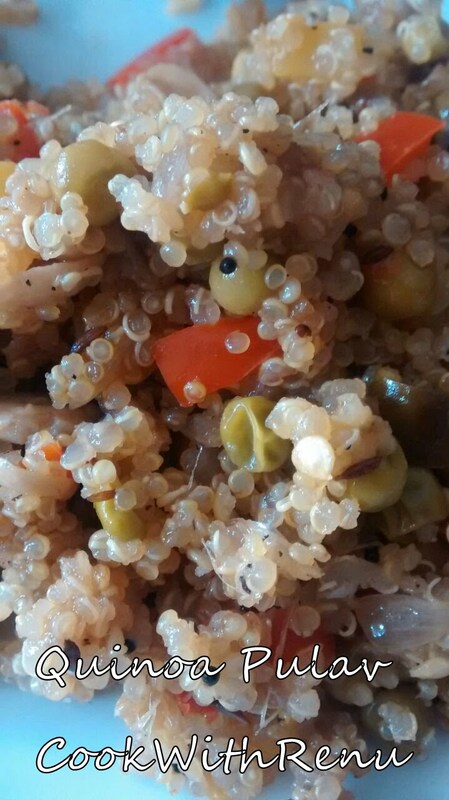 Saok the Quinoa for 15-20 minutes in normal water. In a pan add oil. Once hot, add the mustard seeds. Add the capsicum and green peas and saute for 1-2 minutes. Saute the Quinoa for 3-4 minutes so that it gets roasted. Now add 1-1.5 cups water and let it cook on medium heat for 10 minutes. The Quinoa will become translucent and will puff up once cooked. If desired add more water and let it cook for another 5 minutes or so.